« Their Demands Demonstrate Their Insanity! This entry was posted on Monday, October 3rd, 2011 at 22:45 and is filed under Call To Action, Media, Occupy Wall Street, Politics, Sarah Palin. Tuesday, the 4th of October is a new day, like every one before it has been. Like every one before it, it offers new opportunities, but for we supporters of Sarah Palin, it offers one in particular. On this Tuesday, the film by Stephen K. Bannon, The Undefeated comes to stores near you on DVD! Now, you will be able to get your own copy, and purchase them for friends and relatives, but best of all, you can hold your own The Undefeated viewing parties. Do you want the truth about Governor Sarah Palin to get out to an audience hungry for a different kind of leader, but who have been led astray by the Lamestream Media, and even some in the GOP establishment? If you want your chance to show people the truth, to correct the record and inform them, finally, here’s your chance. I received my copy today. Tomorrow, I intend to go by the local Walmart and round up a couple copies to distribute to friends who’ve been led into doubts about Governor Palin. It’s time that this story is told to a wider audience, and we are just the people to help the film tell it. This film is a wealth of real information about the real accomplishments of a real American champion of liberty. For once, we have a new opportunity to go out there and make that difference we always say we wish to make. I’m going to ask you, my readers, to submit your stories over the coming days and weeks as you hold viewing parties, and let everybody here know what it was like. Provide the impressions of your guests, and tell me about them. Let’s make of this the opportunity it should be to bring Americans together around the truth. Submit your stories about your viewing parties as comments on this post. Politics is an ugly game at times, but as we all know, it frequently has deadly-serious consequences. We mustn’t permit this story to go untold, and I firmly believe this is our best opportunity to correct the record about an American who has faced incredible injustices at the hands of the media and the permanent political class. Here’s your opportunity. We always lament the media attempts to destroy Sarah Palin. We rightly complain that we’re treated almost as poorly. Here’s your opportunity to begin changing all of that at a more rapid rate. It’s the most effective debunking tool for all the media lies. Pick up your copy of The Undefeated, the film that may yet help change the world. It is time to mobilize our "boots on the ground." With the release of "The Undefeated" we can certainly educate the electorate. Thanks Keith! Time to move with the truth! I'm in all in. I've had pay for view parties of "The Undefeated". To day I received my 2 copies from SarahPac and have friends coming this weekend for…you guessed it dinner and a movie. Thanks Mark for all you do. I enjoyed meeting you at the Machine Shed I still can't believe it!!! I know my DVD from SarahPAC is in my P. O. Box just waiting for me to pick it up. I'm going to Walmart to buy some more copies. While I'm hanging out there, I'll be handing out O4P cards. I've already seen "The Undefeated" and can't wait to start sharing it at every opportunity that comes my way. Yes, it is a new day and a new opportunity to get the truth out. Since Christie has announced that he is out, where will everyone be looking to fill that great void in the field of declared candidates? Sarah's strategy for an announcement is coming right on time. 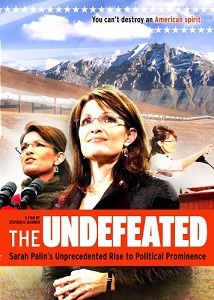 With the "The Undefeated" DVD being mass released into the public, they will get their chance to digest it and then, BAM, Sarah's announcement will rock the world, sucking all the wind into her sails from all other potential candidates. She is a master political strategist and plays three tiered chess like no other. She will make a great commander to her generals.